This time of year is all about brackets and competition - so I'm joining in the competitive fun by having a showdown between two different wines from the Bordeaux region in France. 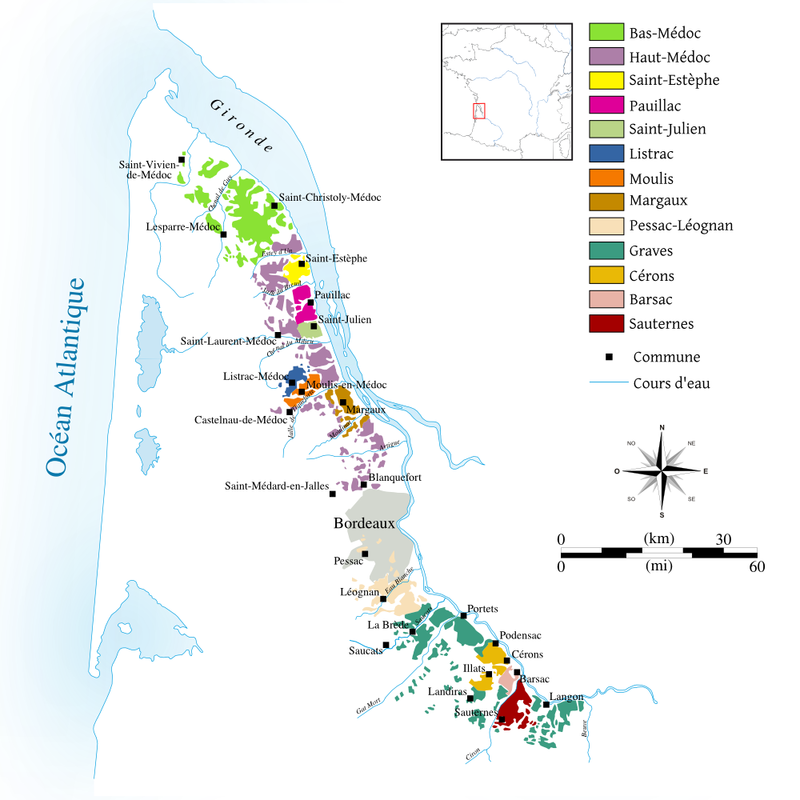 The Bordeaux region is divided by the Gironde river into the Right Bank and Left Bank. For the showdown, we have one wine from the Margaux region of the Left Bank going up against a wine from the St. Emillion region of the Right Bank. 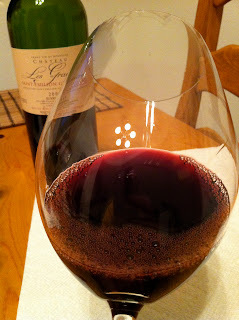 Left bank red wines are generally blends dominated by Cabernet Sauvignon blended with one or more of the following: Merlot, Cabernet Franc, Petite Verdot, and Malbec. 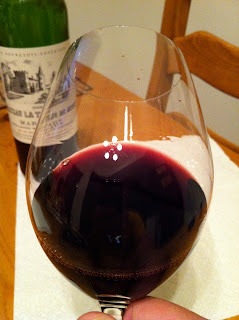 Right bank red wines are generally also blends, but with either Merlot or Cabernet Franc playing the lead role. There are also examples of Bordeaux wines that may be 100% of a single grape variety - but those are more the exception than the rule. Both of our Showdown wines are from the 2005 vintage, and I've had these tucked away aging since I bought them in 2010. 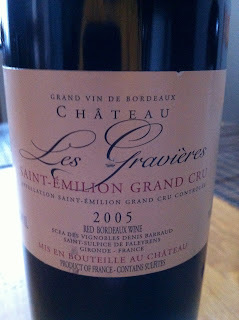 Back in 2010 I had read a lot about how the 2005 vintage was supposed to be outstanding, so although I don't buy much French wine I wanted to get a couple good examples and let them age a couple of years. Although the wines could age and improve for many years, I'm hoping they are ready to go (and up for the competition) - so let's find out. To help out with the showdown, the wines will be tested alone, plus with a variety of cheeses from around the globe, plus a wonderful salami (I love Whole Foods!). One Does not Live by Wine Alone! Drunken Goat Cheese from Spain (right side of the picture). Brillat-Savarin Cheese from France (bottom of the picture). Stilton Blue Cheese from England (left side of the picture). Caramelized Onion Cheese (top of the picture -this stuff is amazing, you must try it!). Sopressata Salami (middle of picture). 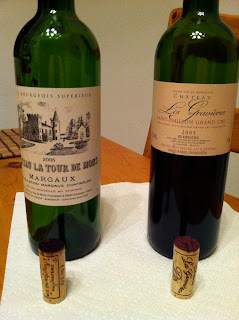 Now... on with the Bordeaux Showdown! I chose to write it like two kicked up wine reviews, throwing in my notes on the food pairing. Appearance: Wine is clear with a dark red center and a water white rim. No sign that it is aging based on the color. Aroma: Very nice blackberry and spices. I decided not to do any additional aeration, and it didn't seem to need it. Taste: Wow! Nicely balanced, silky tannins, and a nice long finish. One of the best Bordeaux wines I've ever tried. It could likely age a while longer, but it may just lose some of the nice fruit flavors - the tannins don't need any time to mellow. Drunken Goat Cheese from Spain. Not a bad pairing, but the cheese was a bit too acidic so did not do any favors to the wine. Brillat-Savarin Cheese from France. I had read that this cheese, a triple cream that looks a lot like brie would be a good pairing with Bordeaux. However, it was more acidic than the drunken goad cheese so this was not a good pairing at all. 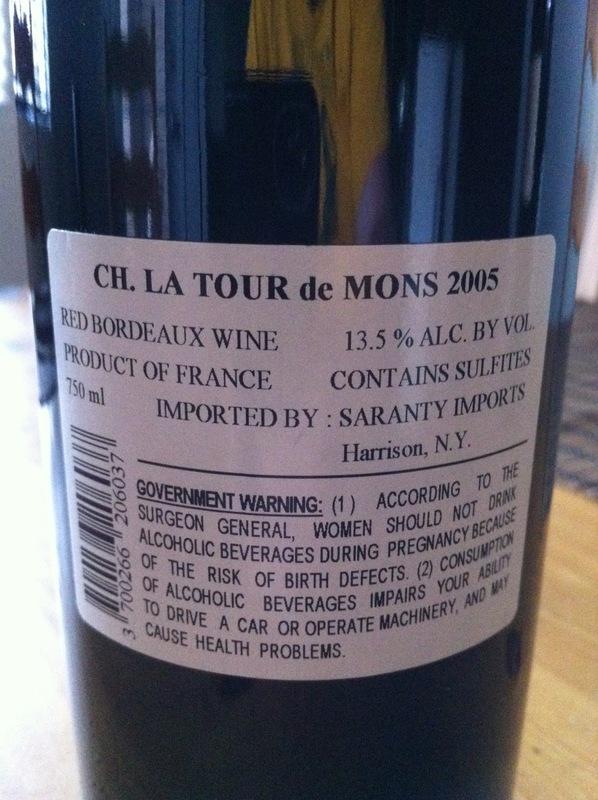 It negatively impacted the wines taste - probably a better pair with a more acidic wine like a Pinot Noir/Burgundy. Caramelized Onion Cheese. A fantastic pairing! 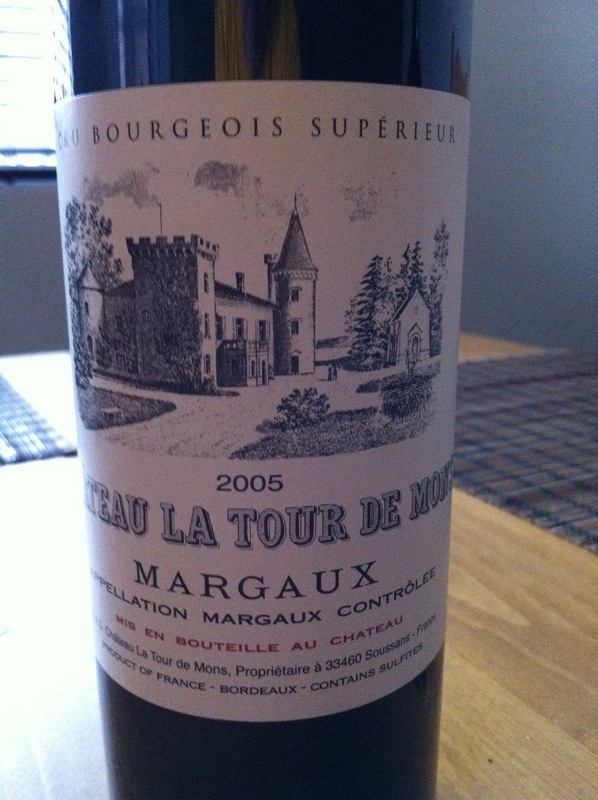 Absolutely delicious, the wine accentuated the sweetness of the caramelized onion very nicely. Sopressata Salami. 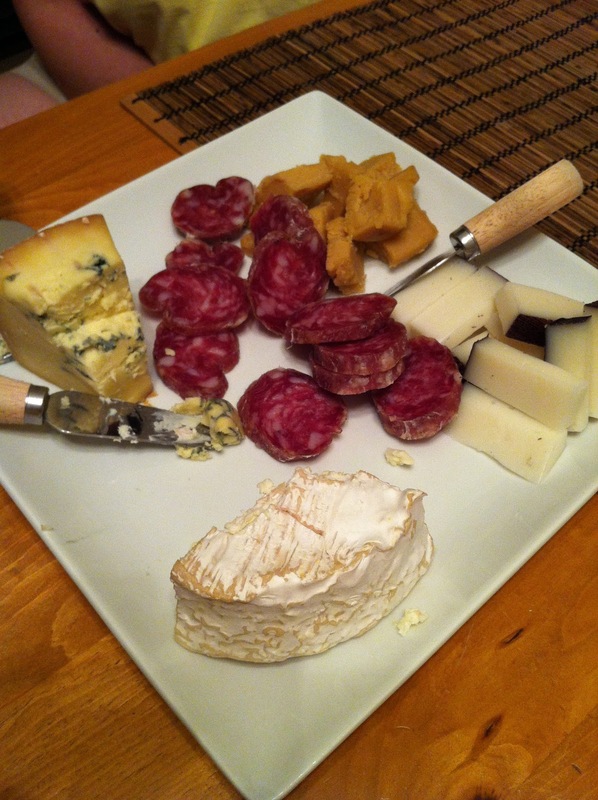 The salami was also a great pairing, with the wine accentuating the spices in the salami very nicely. The Grade: I give this one an A. A very nice wine on its own, one that I think is worth the price you have to pay now of $50 a bottle (at Total Wine anyway). It also shined with two of the cheeses and the salami, so would be a nice food friendly wine big enough to stand up to Beef and Lamb dishes. 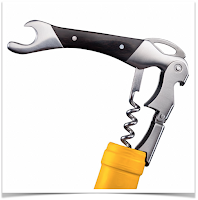 Grape Varieties: Merlot - 100%. 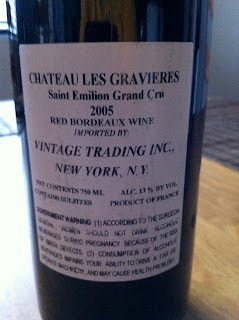 This wine turned out to be one of those Bordeaux exceptions that are 100% of a single grape variety. Aroma: Fairly reserved aromas with blackberry and dark chocolate. Taste: A nice fruity wine, not very complex. Not very tannic, and not a very long finish. Drunken Goat Cheese from Spain. The wine did not negatively impact the taste of the cheese, but the acidity in the cheese made any flavor of the wine disappear. Brillat-Savarin Cheese from France. 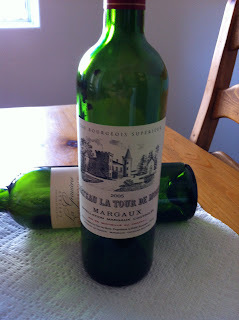 A truly bad pairing, the acidity overwhelmed the wine and made both taste overly tart and unpleasant. Stilton Blue Cheese from England. Again, the wine did not negatively impact the flavor of the cheese, but the wine's flavor disappeared. Caramelized Onion Cheese. The sweetness of the caramelized onion was accentuated a bit, but nothing near the other wine. Sopressata Salami. To round out a full sweep of sub-par food pairings, the salami tasted OK, but the pairing did not elevate the flavor of the salami, and the wine's taste was lost behind the spiciness of the salami. The Grade: I give this one a C-. 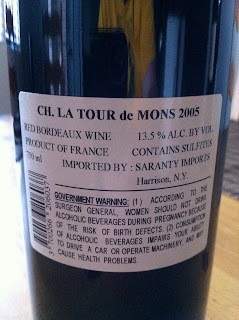 Without the food pairings I may have given this wine a bit of a higher grade (maybe a C+ at most), but for a $40 weekend wine it just was not very impressive. 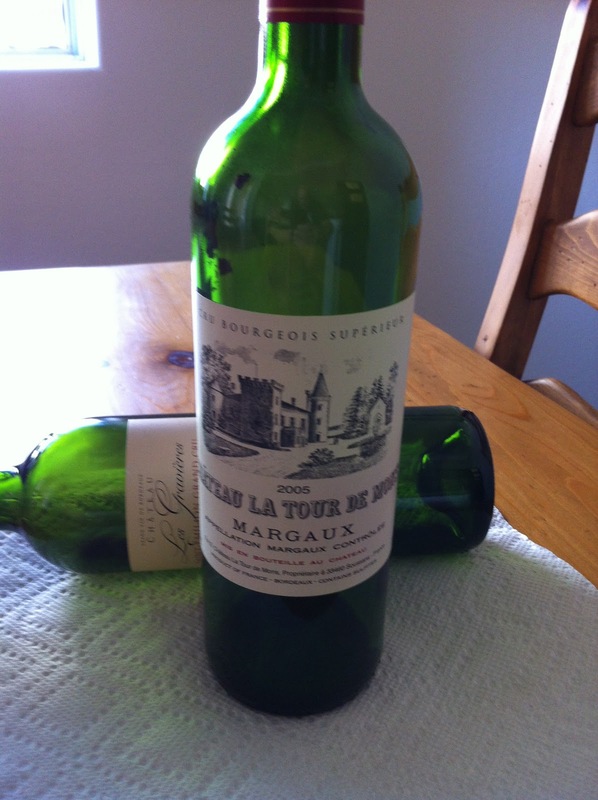 It did not having any real faults and was pleasant enough to drink alone, but for the same price you can find 2-3 other bottles of Merlot just as good for sitting back and sipping.